Ocala, Fla. – The Live Oak International came to its exciting conclusion on Sunday with all five USEF Combined Driving National Championship divisions completing the cones phase. Chester Weber earned his record 15th USEF Four-In-Hand Combined Driving National Championship title with an overall score of 166.69 penalties, while four combined drivers earned inaugural USEF intermediate national titles. These included: Scott Adcox in the pair horse division with 185.39 penalties; Jennifer Keeler in the single pony division with an overall score of 144.70 penalties; Jennifer Thompson in the intermediate single horse division with 140.94 penalties; and Katie Whaley in the pair pony division with 140.29 penalties. Weber (Ocala, Fla.) added another championship title to his massive list of accolades on Sunday. With a big lead after the dressage and marathon phases, he was able to take it easy in the cones phase. He maneuvered his KWPN geldings, First Edition (eight years old), Boris W (11 years old), and Asjemenou (12 years old), along with Jane Clark’s Dutch Warmblood gelding Splash (14 years old) and knocked one minor ball, adding three penalties to his overnight total. “I was very pleased with the horses in the warm-up. We have only driven this combination in one other competition. Live Oak is always a little confusing for them because they have the World Cup Qualifier [jumping course] with flowers and everything built in the arena, which isn’t typical in our sport. But they handled that. I think this is a team that can consistently go clear,” said Weber. Commanding the same team in Thursday’s dressage phase, the unit performed a seamless test to start the competition with 40.11 penalties. Weber substituted Splash for Reno, his eight-year-old, for the marathon and the team earned the fastest time across all seven hazards adding 123.58 penalties to his score. Weber, who serves as Co-President of the Live Oak International with his sister Juliet Reid, stepped up to add the intermediate USEF Combined Driving National Championships, and they were a resounding success. “From an organizer’s standpoint, we were really pleased to [offer the intermediate championships]. To have them in this group has been great, and to see entries come from everywhere to support the championships has been well worth it for us as an organizing team. I’m really proud of all the people who came out and contested those medals,” added Weber. Lisa Stroud (Kennett Square, Pa.) and her and Willow Star, LLC’s team of Dutch Warmblood geldings (Anesco 4, 12 years old; Ulco, 16 years old; Olando, 21 years old; and Enzo, eight years old) followed Weber as the division’s reserve national champion, despite an inconsistent cones test, accumulating 9.34 penalties. They began competition in third place following dressage with 53.15 penalties and jumped to second after marathon with 127.72 penalties. As the only competitor finishing in the intermediate pair horse division, Adcox (Myakka City, Fla.) earned the division’s national championship. Electing to continue with his KWPN gelding’s Nupafeed Auto Pilot (13 years old) and Pepe (six years old) for the cones phase, they added nine penalties to their overall score. Adcox borrowed Tom Warriner’s Harley, a 14-year-old Saddlebred/Friesian gelding, to help with the dressage phase. Along with Pepe, they finished with 60.88 penalties. The young Pepe stayed with the veteran Nupafeed Auto Pilot through the intimidating marathon course to add 105.07 penalties. Despite 0.21 time penalties after the cones competition, Thompson (Lodi, Wis.) and her seven-year-old Funnominial C.G. retained their two-phase lead for the division’s national championship. She and her Dutch Warmblood gelding delivered a polished dressage test to take the lead early on Friday, collecting 53.84 penalties. Although they didn’t win Saturday’s marathon phase, their nice dressage start helped them maintain their lead, adding 86.89 penalties to their dressage score. Taylor Bradish (Windsor, S.C.) and Katrina Becker, owner of Bradish’s horse Katydid Duchess, decided to introduce the nine-year-old Welsh Pony Cross to intermediate competition at Live Oak. The decision paid off as they obtained the division’s reserve national championship title with 145.24 penalties. Sitting in second place after two phases, they dropped one ball on the cones course, adding three penalties. They began the competition in fourth place following dressage with 59.04 penalties. Although the youngest competitor in the national championship divisions, Bradish drove Katydid Duchess like a pro. She navigated the relatively inexperienced mare, quickly and efficiently, winning the marathon phase, adding 83.20 penalties. Whaley (Paris, Ky.) chose to continue with her Welsh Pony Cob’s Tommy (14 years old) and Tanner (11 years old) for the cones phase. They completed a clean round to retain their overall lead for the intermediate pair pony title. She partnered Tommy with her youngest Welsh Cob Teddy (five years old) for Friday’s dressage test, collecting 61.76 penalties. After sitting in second following dressage, Tommy and Tanner blazed through the marathon course, adding 78.53 penalties. Boots Wright (Ocala, Fla.), using Marko and Rio for cones added three penalty points in the cones phase. With only two entries in the intermediate pair pony division, she won the division’s reserve title with 146.37 penalties. She gave an amazing dressage performance with her German Riding Pony geldings Marko (11 years old) and Mista Q (11 years old) for the division lead on Friday with 50.64 penalties. She dropped to second place following marathon with 92.73 penalties after driving Mista Q and Rio, her 14-year-old Welsh ‘B’ Pony gelding. “I remember when Live Oak was a tiny horse show and seeing [this show] evolve into what it has become has been quite spectacular. It’s really the best driving show in America, and a lot of thought has been put into it. The hazards [in the marathon] are wonderful,” said Wright, who has competed at every Live Oak competition since it began 27 years ago. Keeler (Paris, Ky.) drove a clean and cautious cones course with Zeppo to win the intermediate single pony title. Her six-year-old Hackney gelding made the leap to the intermediate at Live Oak and showed his strong potential, delivering three exceptional phases. They started with a steady dressage test to finish third with 62.40 penalties on Friday. They shot to first place due to a flashy marathon round for 82.30 penalties on Saturday. Janelle Marshall (Williston, S.C.) and Kennebec Joyce, John Merritt’s 10-year-old Morgan mare, earned the division’s reserve national championship title with 145.89 penalties. They began dressage with 67.04 penalties and rebounded in the marathon with the fastest time on course, adding 78.85 penalties. Although, she drove a clean cones round, it was not enough to move to the division lead. Ocala, Fla. – All five divisions of the USEF Combined Driving National Championships faced an intimidating yet thrilling marathon course at the Live Oak International on Saturday. The course included seven technical, compact obstacles questioning the obedience and athleticism of the equine athletes. This influenced the fluctuation in the top three across all divisions, while two new drivers took the lead in the intermediate single pony and intermediate pony pair divisions. The 14-time advanced four-in-hand national champion Chester Weber maintains his lead with 170.44 points and Jennifer Thompson holds the intermediate single horse division lead with 140.73 points. Scott Adcox has the intermediate pair horse lead off default as Shane Doyle elected to retire. Jennifer Keeler moved into the lead in the intermediate single pony division with 144.70 points, and Katie Whaley advanced to the intermediate pair pony lead with 140.29 penalties. Weber (Ocala, Fla.) is one phase closer to acquiring his 15th four-in-hand national title. He and his powerful team of KWPN geldings (First Edition, eight years old; Boris W, 11 years old; and Asjemenou, 12 years old) and Reno (eight years old) maneuvered the course efficiently, picking up 123.58 penalties. Despite a broken piece of equipment on course which cost them 10 penalties, they hold a dominating lead. Lisa Stroud (Kennett Square, Pa.) and Willow Star, LLC’s team of Dutch Warmblood geldings (Anesco 4, 12 years old; Ulco, 16 years old; Olando; 21 years old; and Enzo, eight years old) added 127.72 penalties to move to second place going into Sunday’s cones phase. “It’s a really fun, challenging course here. Lots of good questions are asked. I’ve been really fortunate with 10 years of experience with the ponies. The ponies weren’t little. 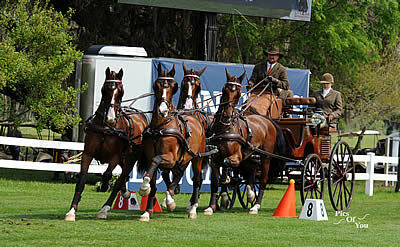 They were big, so the transition to horses was not as difficult because it’s the same style of driving. That’s been really helpful,” said Stroud. James Fairclough (Newton, N.J.) and his team of Dutch Warmblood geldings (Bento V, 11 years old; Dapper, nine years old; and Zenden, 13 years old) and a KWPN (Citens, 10 years old) gelding advanced to third place. He accumulated 133.59 penalties in the marathon for a score of 189.34. Adcox (Myakka City, Fla.) remains as the only competitor in the intermediate pair horse division as Doyle (Hillsborough, N.J.) elected to retire from competition due to an injury to one of his marathon specialist horses. He drove his KWPN geldings Nupafeed Auto Pilot (13 years old) and Pepe (six years old) in the marathon and finished with 105.07 penalties. He was impressed with his young horses’ willingness throughout the course. Thompson (Lodi, Wis.) and her seven-year-old Funnominial C.G. carried their momentum from Friday’s dressage phase over to an excellent marathon phase to remain the intermediate single horse leaders. She and the Dutch Warmblood gelding drove a consistent, cautious marathon to end the day with 86.89 penalties. Taylor Bradish (Windsor, S.C.) and Katydid Duchess, owned by Katrina Becker, added 83.20 penalties for an overall score of 142.24 penalties to move from fourth to second place following two phases. This is the toughest atmosphere the nine-year-old Welsh Pony Cross mare has faced but handled the environment exceptionally well for a first-timer. Anna Koopman (Middleburg, Va.) and Night Chief LMS, Robert Koopman’s seven-year-old American Dutch Harness gelding, moved down to third place, adding 96.37 penalties, with an overall score of 150.69. Whaley (Paris, Ky.), no stranger to Live Oak combined driving events, is using this opportunity to train her youngest Welsh Cob Pony Teddy (five years old), who competed in Friday’s dressage phase on behalf of the team with Tommy (14 years old). Not ready, for the challenges of a Live Oak marathon course, she hooked up Tommy and Tanner (11 years old) for marathon. Their experience propelled them to the lead, adding 78.53 penalties. “My navigator [Colton] says this was our best [Live Oak marathon] round in years. The sixth [fountain] hazard was the most difficult, but we found the best route; Colton was exceptional,” said Whaley. Boots Wright (Ocala, Fla.) dropped to second place adding 92.73 marathon penalties to her overall score of 143.37. She drove Mista Q, her 11-year-old German Riding Pony gelding, and Rio, her 14-year-old Welsh ‘B’ Pony gelding. After a conservative dressage phase, Keeler and Zeppo exploded through the marathon course. They added 82.30 penalties and move into the lead by less than one penalty point. She is competing her six-year-old Hackney gelding in his first intermediate event and could not be more pleased with his development and heart. Janelle Marshall (Williston, S.C.) and Kennebec Joyce, John Merritt’s 10-year-old Morgan mare, earned the fastest marathon time in the division to advance to second place, adding 78.85 penalties for an overall score of 145.89 penalties. “Her fitness and air intake was huge [for the marathon]. In the sixth [fountain hazard], she was a machine and stayed very true and honest, so I was super proud of her,” said Marshall. Kristin Whittington (Edinburgh, Ind.) and Symphony dropped to third place overall with a score of 150.52 penalties. She and the eight-year-old Welsh Pony Cross mare added 93.08 penalties to their dressage score. Ocala, Fla. – The USEF Combined Driving National Championships got underway with the first of three phases at Live Oak International. Two of the five championship divisions completed their dressage tests; Scott Adcox takes the early lead in the Intermediate Pair Horse division with a score of 60.88 penalties. Chester Weber tops the leaderboard in the four-in-hand division with a score of 40.11 penalties. Adcox (Myakka City, Fla.) and Shane Doyle (Hillsborough, N.J.) broke in the arena footing as the Intermediate Pair Horse division opened the first day of competition. Adcox, who returned to combined driving this year after taking a year off from competition, finds himself in the lead with Harley, Tom Warriner’s 14-year-old Saddlebred/Friesian gelding, and Pepe, his six-year-old KWPN gelding. Doyle follows with a score of 66.64 penalties with his geldings Valentino, a 15-year-old KWPN, and Bono, a 14-year-old Dutch Warmblood. The 14-time USEF Four-in-Hand National Champion Chester Weber (Ocala, Fla.) carries the early lead in the four-in-hand division. He and his KWPN geldings, First Edition (eight years old), Boris W (11 years old), and Asjemenou (12 years old), along with Jane Clark’s Dutch Warmblood gelding Splash (14 years old), executed a near flawless test to finish on 40.11 penalties. Following Weber is the 2017 USEF Four-in-Hand Reserve National Champion Misdee Wrigley Miller (Paris, Ky.) and her KWPN geldings Beau (11 years old), Bravour 54 (10 years old) and Bolino D (11 years old) and her Dutch Warmblood gelding Calipso 86 (10 years old) with 46.84 penalties. Allison Stroud (Kennett Square, Pa.) and Willow Star, LLC’s Dutch Warmblood gelding team of Anesco 4 (12 years old), Ulco (16 years old), Olando (21 years old) and Enzo (eight years old) sit in third place with 53.15 penalties.